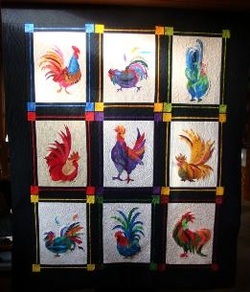 All of Kathleen Herbach’s quilting has an “art” element that she cannot resist, for quilting is, first and foremost, a creative outlet for her. Although she doesn’t necessarily design her own quilts, she customizes existing patterns and ignites them with color to make them her own. Learning new techniques gets her moving and she seldom, if ever, repeats a pattern. Motivated by the innovative work of others, such as George Siciliano’s Seven Twisters, some of the quilters who continue to inspire her are Libby Lehman, Jan Krentz, Leah Day, and Susan K. Cleveland. She browses quilts at www.thequiltshow.com regularly. Teaching herself machine quilting has been a worthwhile effort for her, as one can readily tell from her beautifully quilted works done on her home machine. Her bee, the Quarter-Inch Queens, and other talented RQG members are her “go to” resource folks when she needs a hand mastering a process. Living all over throughout her youth and early adulthood – from Minnesota, to Georgia, to Indiana, then Michigan – she has now managed to live in Illinois longer than anywhere else. She first became interested in quilting about twenty years ago when her mother, also a quilter, caught her attention with a flip ‘n sew technique that aroused her interest. ​Kathy joined RQG in 2004 after she retired from a career as a software programmer and business owner. A member since 2004, she has served the guild as president, recording secretary, a leader of workshops for the contracts chair, and co-chair of the small quilt auction for several years. Currently, she teaches classes at quilt shops in the local area. She hopes to see the guild provide more special events to challenge that creative quilter inside all its members.